Drill collars locations and orientations, Bergby Project. 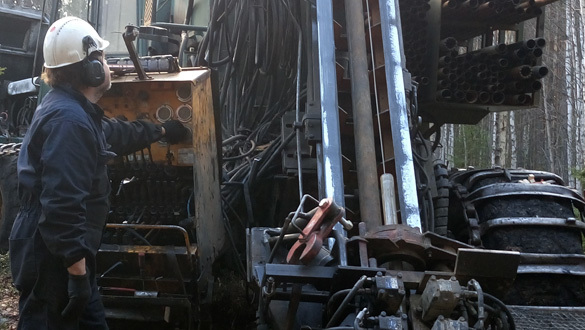 Drilling was conducted with “Wireline 56” equipment proving core with a diameter of 39mm. The Bergby project lies in central Sweden, 25km north of the town of Gavle, and is secured by three exploration permits for a total of 1903Ha. The site is close to infrastructure, with major roads, rail and power supply passing immediately adjacent to the claim boundaries. The village of Norrsundet lies 5km east of the Bergby project, a deep-water port where until recently a major wood chip and pulp mill operated. Norrsundet provides an industrial site and port and handling facilities, where processing and shipping of lithium or feldspar concentrates could be easily performed. Leading Edge Materials Corp identified and staked the Bergby lithium project on free ground in early 2016, following on from a regional project generation exercise. Areas prospective for LCT (lithium-caesium-tantalum) pegmatites were identified in various datasets from the Swedish Geological Survey. In one dataset, a boulder sample included the description of the presence of the lithium mineral spodumene. LCT pegmatites are a chemically and mineralogically distinct set of intrusive rocks which host most of the world’s hard rock lithium deposits. They consist principally of quartz, potassium feldspar, albite, and muscovite. Common accessory minerals include garnet, tourmaline, and apatite, whilst major lithium ore minerals include spodumene, petalite, and lepidolite. In addition to lithium, LCT pegmatites are also mined for tantalum, caesium, tin, ultrapure quartz, po tassium feldspar, albite, and muscovite. A program of mapping and sampling of the Bergby site during 2016 located an extensive lithium-mineralized boulder field, as reported in full during November 2016. Assay results from 41 boulders are provided in Table 1, where Li2O (lithium oxide) averaged 1.06% and ranged from 0.03% to 4.56%; and Ta2O5 (tantalum pentoxide) averaged 168ppm and ranged from 1 ppm to 499 ppm. Further mapping located lithium mineralization in outcrop, as reported during December 2016. Fifteen samples from three outcrop areas returned Li2O averaging 1.71% and ranging from 0.01% to 4.65%; and Ta2O5 (tantalum pentoxide) averaging 133 ppm and ranging from 16 ppm to 803 ppm (see Table 2). Samples included representative chip samples, composite samples and selective grab samples depending on outcrop quality, and were taken from three sites across an area of approximately 350m x 750m. Three principal styles of lithium mineralization have been observed in boulders and outcrops, providing encouragement that mineralization may be extensively developed. Ground magnetic data and partial leach soil sampling was also completed during late 2016, providing a picture of the distribution of the potentially lithium-mineralized pegmatites. Holes BBY17025 to BBY17029 were drilled along the strike of the pegmatite to the north of earlier drill hole, up to 800m from the discovery zone (hole BBY17029). 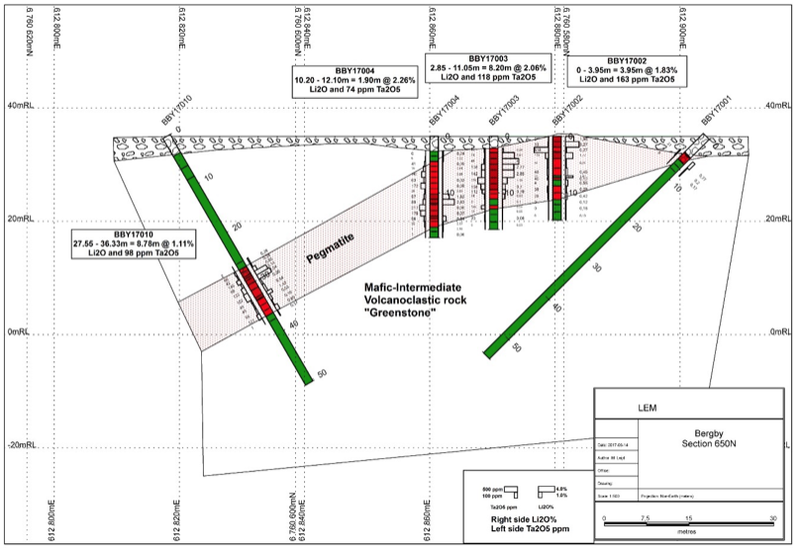 Where pegmatite was intersected in this northern area, it was notable for a lower lithium grade and a significant increase in the tantalum grade, suggesting a different style of LCT pegmatite (lithium-cesium-tantalum) was intersected. Pegmatite was not intersected in holes BBY17027 to BBY17029, which may indicate a steeper dip than anticipated from nearby lithium mineralized outcrop. Holes BBY1030 to BBY17033 tested down dip from earlier drill holes, and all except for BBY17032 intersected high grades of lithium mineralization consistent with previous intersections. Mineralization remains open in a down dip direction over at least 600m of strike. Bergby has now been tested by a total of 1525m of drilling in 33 drill holes to a maximum depth of 131.1m over an approximate 1500m strike length. Newly discovered lithium project in central Sweden, less than 100km from the Woxna graphite mine and close to major infrastructure. Bergby lies in central Sweden, 25km north of the town of Gävle, secured by three exploration licenses that cover a total of 1,903 Ha. The site is close to infrastructure, with major roads, rail and power supply passing immediately adjacent to the claim boundaries. Bergby has been tested by a total of 1525m of drilling in 33 drill holes to a maximum depth of 131.1m over an approximate 1500m strike length. Preliminary petrographic studies indicate the presence of the lithium minerals spodumene and petalite, which should support a traditional mineral processing path.